1. 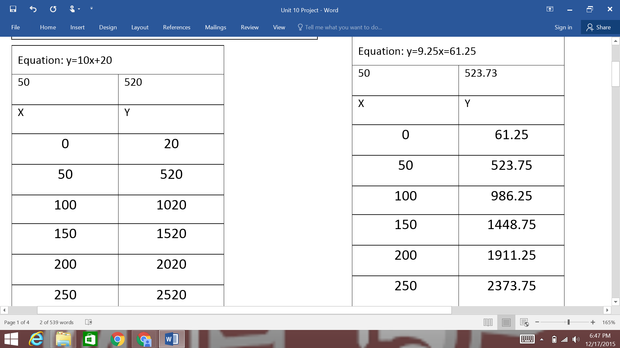 Describe how you created each equation. 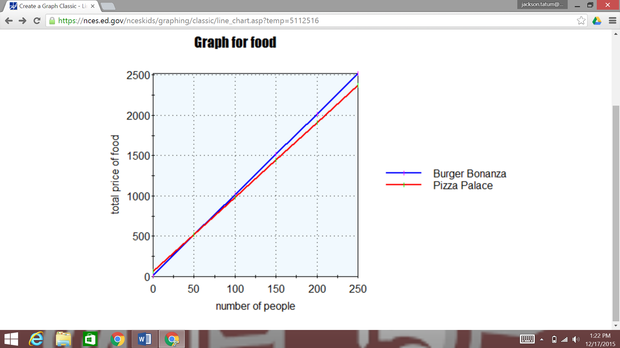 I put the numbers in the y=mx+b equation format and typed it at the to the graph. 2. Will there ever be a number of students where both companies will cost the same? Describe the steps you would use and then solve for the number of students for which both companies will cost the same amount. Yes there is , at 100 people the coast is the same. The first step is to create and fill in the table. 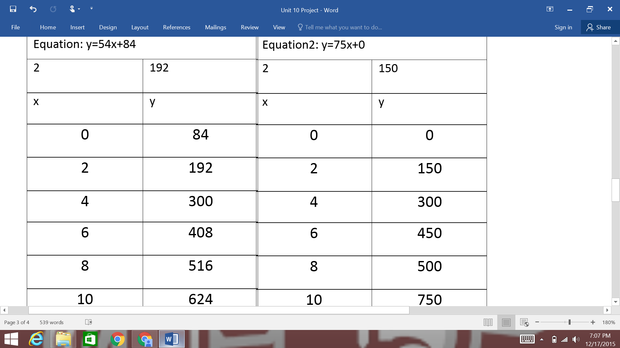 After you create and fill in the table you look at when the numbers are the same. 3. If you only have a budget of $1000 for food, how many people, maximum, would you be able to have at the 7th Grade Blowout for each company? Can you have a decimal or fraction as part of your answer? Why or why not? 100 students and staff could come because at that point the coast the same. No you cannot have a decimal point because you can’t have of a person. Plan: Get pizza palace if 50 or more students and staff show up. But if only 49 or less students and staff show up than get burger bonanza. 2. Will there ever be a number of hours where both companies will cost the same? Describe the steps you would use and then solve for the number of hours for which both companies will cost the same amount. Yes at four hours both companies will cost the same. The steps to find the point of intersection we first step is to create and fill in the table. After you create and fill in the table you look at when the numbers are the same. 3. If you only have a budget of $750 for the bounce house, how many hours, maximum, would you be able to have at the 7th Grade Blowout for each company? Can you have a decimal or fraction as part of your answer? Why or why not? 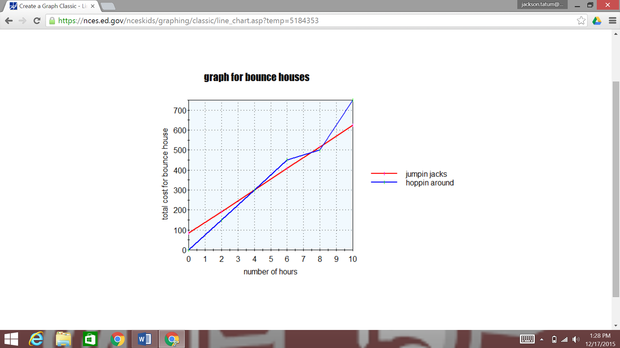 For hoppin around the max is 10 but for jumpin jacks the max is 12 hours. Proposed Plan: any time under 4 hours pick Hoppin around anything between 4 hours and 1 minute and 7 hours and 24 minutes pick jumpin jacks and for 9 hours pick hoppin around and any time over that pick jumpin jacks.